For decades, marine scientists have been warning us this day would come. Coral bleaching occurs when stressful conditions result in the expulsion of the algal partner from the coral. Before anthropogenic climate warming, such events were relatively rare, allowing for recovery of the reef between events. Hughes et al. looked at 100 reefs globally and found that the average interval between bleaching events is now less than half what it was before. Such narrow recovery windows do not allow for full recovery. Furthermore, warming events such as El Niño are warmer than previously, as are general ocean conditions. Such changes are likely to make it more and more difficult for reefs to recover between stressful events. Tropical reef systems are transitioning to a new era in which the interval between recurrent bouts of coral bleaching is too short for a full recovery of mature assemblages. We analyzed bleaching records at 100 globally distributed reef locations from 1980 to 2016. The median return time between pairs of severe bleaching events has diminished steadily since 1980 and is now only 6 years. As global warming has progressed, tropical sea surface temperatures are warmer now during current La Niña conditions than they were during El Niño events three decades ago. Consequently, as we transition to the Anthropocene, coral bleaching is occurring more frequently in all El Niño–Southern Oscillation phases, increasing the likelihood of annual bleaching in the coming decades. The title alone is enough to warn you that what comes after is not necessarily going to be unbiased, hard-nosed science, but ideology. The Anthropocene is an idea, not a formally recognised geological period. Its adoption is being pushed by people like Mark Maslin, for obvious reasons, not without resistance from actual geologists. Thus its use without qualification in a ‘scientific’ study should ring alarm bells. Before the 1980s, mass bleaching of corals was unheard of, even during strong El Niño conditions, but now repeated bouts of regional-scale bleaching and mass mortality of corals has become the new normal around the world as temperatures continue to rise. The study establishes a transition from a period before the 1980s when bleaching only occurred locally, to an intermediate stage in the 1980s and 1990s when mass bleaching was first recorded during warmer than average El Niño conditions, and finally to the current era when climate-driven bleaching is now occurring throughout ENSO (El Niño-Southern Oscillation) cycles. So, they took their data from the 1980s onwards and claim that before then coral bleaching events were localised only, not global. I don’t know if there was any consistent worldwide monitoring of the state of coral reefs prior to 1980, but here’s a thing. El Nino and La Nina instrumental records only go back to 1950. Guess what? There have only been three recorded “very strong” or super El Nino events since 1950 – all after 1980, namely 1982-83, 1997-98 and 2014-16 (NOAA keep messing with the 0.5C 3-monthly mean thresholds for these events, making it difficult to know when exactly they started and ended. Twice now: once when they updated to ERSSTv4, then again when they updated to ERSSTv5). Yebbut, we should expect more super El Ninos because the oceans are warming, right? No, it doesn’t work like that. El Nino and La Nina events are defined by anomalies or departures from a 30 year mean and CPC have now adopted a system where this mean period changes every 5 years in order to account for warmer oceans, so the strength of El Ninos is intrinsic, not relative, and consistently defined throughout the record. Which means that the authors of this study have (cherry?) picked a period in history where very strong El Ninos have been unique and frequent and by no means at all can this fact be unequivocally attributed to climate change. Indeed, it is more likely to be related to the Great Pacific Climate Shift of 1976, whose cause is still something of a mystery. Which means that the global mass bleaching events which the authors identify and which Hughes tells us were “unheard of” before 1980 might be rather more related to super El Ninos than actual generalised warming of the oceans. If so, GHG warming, even supposing it is the main contributor to the rise in tropical ocean temperatures since 1980 (very debatable) is not the principal cause of widespread coral bleaching events; El Ninos are and these events are naturally caused and have been ongoing for centuries. Oh bugger. Friday’s paper also determined the link between El Niño and mass bleaching events has diminished as global warming continues. Prior to the 1980s mass coral bleaching on a regional scale was “exceedingly rare or absent” and occurred in localised areas stretching tens of kilometres, not the hundreds of kilometres affected in recent times, the paper said. These local bleaching events were largely caused by small-scale stressors like unusually hot or cold weather, freshwater inundation or sedimentation. Then global warming increased the thermal stress of strong El Niño events, the paper said, widening the impact of individual bleaching events. Now, they are occurring at any time. “Any time”? That would imply that mass coral bleaching is occurring randomly regardless of El Nino events. This is clearly double Dutch from the Guardian. The paper itself says coral bleaching is occurring more frequently in all El Niño–Southern Oscillation phases. It should come as no surprise then that there have been three mass coral bleaching events since 1980 associated with very strong El Ninos (1983, 1998 and 2016). There is also a fourth mass bleaching event associated with the “moderate” Modoki (Central Pacific) El Nino of 2010. So in that respect yes, there is evidence that even the moderate El Nino in 2010 bleached corals across the world because tropical sea surface temperatures were already elevated. You might say this was because of GHG global warming occurring since 1980. You might also say that it was due to an enhanced release of ocean heat via two very strong El Ninos in 1982-83 and 1997-98. Where did that ‘extra heat’ come from though? Climate scientists will tell you it was prevented from escaping from the planet by demonic CO2. Others might tell you it arose via enhanced direct solar short wave heating of the tropics due to the decrease in tropical cloud cover that occurred from the early 1980s to 2000, remaining stable thereafter. Who knows for sure. Climate scientists just think they know. Climate change activists and warmist politicians don’t think, but they know. What is certain is that the huge El Nino of 2014-16 resulted in yet another major global coral bleaching event in 2016. Warmists freaked out and still are freaking out. The Great Barrier Reef was reportedly dead, then it started to recover, but alas, warmists have not recovered their senses and now tell us that coral everywhere will never recover – ever (unless of course we – but not the Chinese or the Indians – decarbonise yesterday). The study found that time between bleaching events had diminished five-fold in the past 30 to 40 years, and was now too short to allow for a full recovery and was approaching unsustainable levels. While mass bleaching events used to occur about once every 27 years, by 2016 the median time between them had shrunk to 5.9 years. Only six of the 100 sites had escaped bleaching. Just like the shrinking Arctic sea-ice measured over 36 years which was supposed to be the death knell for polar bears, corals are now deemed to be in imminent danger of extinction using 36 years of coral bleaching observations and only 4 recorded instances of mass bleaching – in 1983, 1998, 2010 and 2016. Yes, the time between events has shortened dramatically – but they only have 4 data points to work with! However, this appears to be sufficient to pronounce gravely upon the future survivability of corals in the dreaded Anthropocene, i.e. corals which survived the extinction of the dinosaurs, which survived the rapid 4C global warming of the PETM, which have survived millions of years on a hotter Earth when no ice existed at either pole, are done for because the planet warmed 0.6C after 1980 and we had a few very powerful El Ninos which bleached them. Tags: climate change, coral bleaching, El Nino, science. Bookmark the permalink. It doesn’t matter what, but when I read or hear about a study where cyclic events are involved, covers only a fraction of time and the rest are disregarded, I hear loud warning bells. Anyone with basic skills in statistics understand the problem and knows that making conclutions that way is a no no. In this case, corals have been around for at least 500 million years, so a single window of 30-ish years is relevant how? Thing is, “death warrant for coral reefs as we know them.” is not at all the same as the extinction (or lack of) that you refer to with your guff about 250 million years. I’m sure the faithful will lap it up though. Indeed, it is bread-and-butter to the Guardian. What else, aside from super low tides, causes large scale bleaching events? Jaime. I haven’t read all of your post yet because I was stopped short by a major mistake in the first sentence of the paper you quote from. The photosynthetic symbiotes within modern corals are not algae but dynoflagelates, a quite separate phylum. Anyone writing a speculative scientific paper upon coral reef futures who gets something so basic wrong is already on my low credibility plate. I then read through the abstract looking for something specific – does it mention and attempt to explain why there are no significant developments of tropical coral reefs during most interglacials. This is important because during most interglacials conditions were in some perfectly natural but unknown way unsuitable for massive tropical reefs. The possibility exists that if reefs today begin to decline it could also be for the same subtle reasons that prevented reefs in earlier times. As I expected, nothing in the paper on this subject. So I’m already highly prejudiced against the paper. I happen to believe/know that many reefs are in trouble and probably, in many (or most) cases because of human activities (over fishing, use as building materials, pollution (including high nutrient runoff from fertilizers) and tourism), but probably not from climate change. Going back to the post. Jaime. First you should not use the argument that corals have survived for hundreds of millions of years, because they haven’t. There is no species, genus, family or even group of corals that have survived for so long. Modern corals evolved in the Triassic after the extinction of all Tabulate and Rugose corals. We don’t even know if these older reef builders are related to modern corals nor whether they had zooxanthellae symbiotes. A better factoid to emphasize the resilience of modern tropical reefs is their survival through multiple glaciation episodes when sea levels dropped precipitously killing off 100% of all tropical reefs , not to mention large sea temperature falls. When anyone tries to browbeat you about heating events causing reef death, ask them what the temperature range along the length of the Great Barrier Reef is and whether bleaching events are more prevalent in the much hotter north (they aren’t). Will not even bother getting the paper. Nevertheless it probably does have some truth within it. Sometime in the 1980s there was a significant bleaching event in Florida and I saw the results of research being done (I don’t know if it ever was published) to find preservable evidence of this event – which they found. They then went to cores taken through the entire reefs looking for this same evidence. They found only a single horizon in the entire Holocene record where they could infer the existence of a significant bleaching event. If the paper under consideration had examined the preserved record, as was done in Florida, then they might have been more convincing. OK, I’m no expert on corals, but I believed them to have first appeared IN THEIR CURRENT FORM around 250 million years ago, at the end of the Triassic. Alan confirms this: “Modern corals evolved in the Triassic after the extinction of all Tabulate and Rugose corals”. ‘Corals’, in the very widest biological sense of the word, have been around for BILLIONS of years. “Reefs, in some shape or form, have been around for a very long time. Approximately 3.5 billion (3,500,000,000) years ago microbialites (calcareous organo-sedimentary deposits) begin to appear in the fossil record. Since the Triassic (i.e., over the last 220 million years), scleractinian corals have become increasingly dominant as reef-builders. Diverse (molecular, stable isotopic, ecological) evidence suggests scleractinian corals formed symbioses with algae soon after their appearance in the fossil record. So bar quibbling about technical details regarding which species, genus, family have donated their DNA to modern coral communities, I feel I’m generally correct in saying that “corals have been around for 250 million years and survived several major global extinction events”. You raise some pertinent points Alan with regard to other ecological pressures on modern coral reefs, as does Hunter re. super low tides (which combined with extra sunlight after 1980 might also have severely impacted corals). All of this appears to have been ignored by the authors in favour of declaring man-made climate change to be the single greatest threat to coral reefs. Jaime. To me the argument about corals is similar to that made by someone who says “don’t worry about the survival of the lowland gorilla, Hominids have lasted 6 million years”. Some of the same coral species survived the last glacial low sea stand, when all modern reefs would have been killed off for many tens of thousands of years, making the argument I suggested the more forceful. But each to their own. Corals in reefs have been climate poster animals, but theories suggesting they are in peril from CO2 (by causing heat stress or ocean acidification) can easily be rubbished. Nevertheless I expect a new push on acidification soon as cold winters distract punters from the Holy Warming Grail. Lots of food for thought. One point of Alan’s is particularly thought provoking – about the rapid changes at the end of the last ice age. Any local species that inhabits an area that was totally different at the height of the ice age isn’t in it’s ‘natural’ location and to get there must have survived very rapid climate change. Corals are probably the best example. Corals set up where they do because they need those conditions. The right distance below sea level, something to stand on and food. So long as the bleached areas haven’t fundamentally changed, there are queues of baby corals waiting for vacant possession. One of the guys connected to the report said the other day that the faster corals took about 10 years to recolonise. He didn’t say what the timescale was for the slow ones. It may be that they could speed the process up by hoovering up coral babies at a spawning event and depositing them directly on a bleached reef, even if it was just done for the slow movers. The other thing would be to create artificial reef bases in ‘better’ areas, although the corals may argue about what is better and stubbornly ignore the scientists’ version. SCUBA diving got going in the 1970s, as kit, training and travel became more accessible. Warm tropical waters were far more popular with sports divers and marine biologists, and Australia discovered a whole new industry, drawing in tourist and science research money from all over the world. Australia has done very nicely out of every fresh GBR scare story. The post heading is correct, except that the polar bear death spiral nonsense was falling to pieces a decade ago. Ocean acidification and coral bleaching were far better, as they were more photogenic, and better for generating tourism money. Tourists can be taken to carefully selected dive sites, to take their own underwater colour photographs, as evidence, but based on a “snapshot” in time, of a continuous process. Alan, thank you for your review of the essay. Your point about the proper ageing, correct identification of the symbiote, etc. are appreciated. If I understand the process of bleaching in general, it is that unusual low tides expose parts of the impacted reef to the air or to such shallow water that the coral is heated up and either way goes into shock. Is this correct, or are there other mechanisms to cause bleaching? Hunter, dead coral is calcium carbonate. It is white (ish). Those that have tried (I haven’t) to keep marine aquariums, with live corals, know that they are susceptible to dying, if conditions vary. Marine biologists have known this since before the Aqualung was invented. Seawater is full of embryonic coral looking for a starter home. Dead coral is ideal. Forest fires occur naturally, and are part of the natural lifecycle and regeneration. They are devastating, but after a few years, fresh growth thrives. Nature can clear deadwood, BioScience can’t. Hunter based on memory alone I believe reefs are built from real goldilocks organisms – conditions must not be too hot or too cold over the long term, or the short term, waters must not be too saline or too brackish, they don’t like excess sediment (although in Thailand they may inhabit muddy delta estuaries) or nutrients. Almost any environmental change and they can throw their zooxanthellae and pigments out of their prams and sulk in glorious white nakedness. It has been shown that this is an environmental response and the bleached corals are recruiting a different suite of zooxanthellae more adapted to the new conditions. Because the stressors can be short lives, presumably corals get their old symbiots back, with comments like “sorry for the misunderstanding”. I found it particularly interesting that the most recent widespread bleaching event was associated with an exceptionally low (and therefore long) tide during the day. Strange there were no first hand observational reports of this event and the old chestnut of climate change was immediately pulled out of the shed, leaving the bloody great bus of a low tide still parked under cover. Alan Kendall, I am sure that by Victorian times of plant and animal collection and study, it was realised that keeping coral alive in a laboratory tank or marine aquarium was difficult, with minor changes to temperature pH etc being critical. I expect that some of the collectors and marine biologists realised that this was all part of the natural ecology and regeneration, just as a forest fire is. The Green Blob are very good at blaming natural phenomena on Global Warming. GolfCharlie I once spent two weeks at a Marine Observatory in northern Jamaica where I was told that it was exceedingly difficult to maintain an sea aquarium even with permanent access to fresh seawater. Organisms in parts of a reef isolated from the main reef, can also suffer fatally. Another aspect is the huge variation over time and space that occurs in reef health. When I was there, one part of the local reef, which had been closely monitored for decades, was unprecidentally being devastated by a huge group of long-spined Diadema sea urchins, munching away and converting a formerly beautiful coral reef into an area of green algal lunch for the echinoids. No one knew why. Now, of course, we know; it’s the demon dioxide molecule. Alan Kendall, I remember 30(?) years ago a TV documentary about the Crown of Thorns Starfish that was going to eat it’s way through all living coral and destroy the GBR. I expect the Australian economy did quite well out of all the free advertising for the beauty of the GBR. For Europeans especially, if they want to scuba dive amongst coral and fish in warm water, the Red Sea is far cheaper to access, with better reliability for good weather, all within easy reach of hotel complexes with mod cons. Also, no man-eating sharks or box jellyfish! Just remember not to step on sea-urchins though . . . . .
but at least there are no stonefish or cone shells, much more likely to kill you than sharks (unless you dive at night). The temperature of the Red Sea is subject to seasonal change, but not to the sudden change caused by different ocean currents and weather systems. Sharks are encountered in the Mediterranean Sea ( don’t tell tourists) but I think they get there because they are lost, in their search for something big enough to eat. I am not surprised that so many scuba diving marine biologists look for a problem to research on the GBR that comes with funding. WWF could do money raising TV adverts to adopt a coral, to save it from bleaching. This could “highlight” some confusion amongst the fashion conscious. 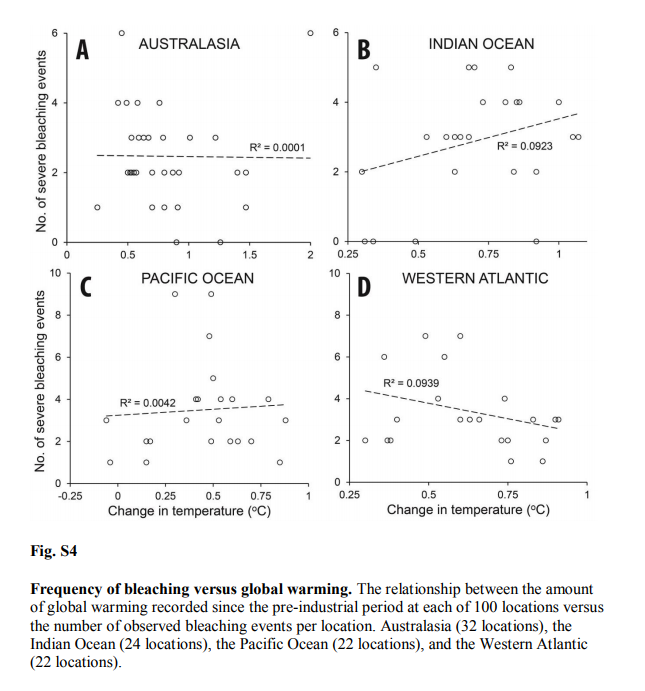 Thanks to Paul for digging out the actual paper, which reveals no correlation between general warming and bleaching events. So the emphasis has to be almost entirely upon El Nino as the causative agent. Jaime. I believe the accepted story has for some time been that El Nino become superimposed upon a longer term gradual warming trend, so that over time El Nino events become ever more extreme and damaging. Bleaching occurred during short term episodes of even warmer events superimposed on the already hotter El Ninos. A short term warming might cause bleaching but if over a few degrees Celsius can cause wholesale mortality. That is why exposed corals during the recent low tides were so devastating -they exposed the corals to unsurvivable heat stress. There appears to be no correlation between generalised post industrial ocean warming and bleaching which, even if El Ninos were vital to give that ‘extra push’, one would expect there to be. I suspect that coral communities are able to adapt to gradually warming oceans, but are ‘knocked out’ by extreme, short-lived warming events. As I pointed out, all of the really extreme El Nino episodes (“very strong”) occurred after 1980 and after the Great Pacific Climate Shift of 1976 which appears to have initiated a period of very rapid warming of global ocean basins in conjunction with ever more extreme El Nino events. With regard to very low tides, I believe it is not aquatic thermal stress which kills corals, but a combination of desiccation and exposure to very strong sunlight which bleaches them. Storms are more likely to break and damage coral at lower tides (very photogenic). They will also stir up more silts and sediments, whilst drawing colder water up from depth at the edge of reefs. Breathing compressed air down to 30 feet is relatively free of health problems, which is where most of the colourful marine life exists Things then get progressively more complicated, and at about 100 feet nitrogen narcosis is a significant risk. Jaime. I was trying to convey what the accepted link was between ElNinos, global warming and coral reef bleaching and mortality events. Not what I believe. With regard to the last bleaching event and low tides, the stressor cannot have been desiccation because similar prolonged low tides previously occurred at night and caused no damage. Emphasis has been placed upon the fact that these unusually low tides occurred during the day. Irradiance might be a stressor, but I doubt it. In tropical seas almost all of the incident radiation becomes refracted into the sea so there is unlikely to be much difference above or below the water surface. Since the coral polyps will have retracted into their skeletons upon exposure, I fail to see how irradiance levels can be important. The most important difference between coral reef scientists relates to whether they support AGW or not. Supporters spread doom like there’s no tomorrow and cover up past failed predictions. Are these the symptoms of some hitherto unrecognized mental disease that especially afflicts scientists? Paul Matthews, that Advert should be reported to the ASA. It does not show claws or jaws. Paul. Do you think The Guardian has any idea what the world’s largest predator can do? It’s like them using a disneyfied boa constrictor with it’s coils around an infant being used to advertising nanny services. LOL. Only in the Guardian. Is there a go-to contrarian for corals in the same way that Crockford is the go-to contrarian for polar bears; an Australian scientist who claims that the great barrier reef is not endangered, for example? A possible example might be Peter Ridd. I’ve never heard of Ridd. I had heard of Crockford and was following her on Twitter before the ghastly paper was published that sought to discredit her, of which all of science should be ashamed for a decade at least. But defenders of the Konsensus are no doubt moving on, the blood stains left in the snow no concern of theirs. First, for some reason you assume at the outset that coral bleaching is related to El Nino events, but the latest mass bleaching event (20% or more total mortality per GBRMPA) happened last year (spring 2017) under ENSO Neutral conditions. The El Nino assumption appears a priori and unphysical (what physical mechanism? ), and clearly invalid just looking at last year – most of the article is clearly moot/incorrect given this. The answer of course is simply that the major cause of mass bleaching is thermal stress, not El Nino events per your invalid assumption. The total oceans have warmed such that sustained local high temperature conditions are more common even under ENSO Neutral conditions. This seems reasonably straightforward and if it is to be disputed the dispute requires physical explanations and supporting evidence. The evidence for greenhouse-driven warming of the oceans is strong (and obviously goes far beyond the above). The evidence for heat-induced mass mortality of corals is pretty ironclad – spatial patterns of sustained heat and bleaching severity clearly line up. The article above doesn’t offer anything to dispute either of these things. One question is whether pace of ocean temp changes is comparable or not, of course. But there is evidence of equatorial decline of reefs during warming. The northern reef was completely ravaged in 2016. I think you are trying to say that there should always be more bleaching in the north because it is warmer. But this assumes that bleaching is about absolute temperature, rather than temp increases relative to what the corals in a particular climate zone are used to. I note that you keep on with the old view that increasing temperatures alone cause bleaching when in reality a great many changes accomplish this phenomenon – spells of low temperature, fresh water influx, high salinities, low tides (especially by day) and so on. You and others seem to believe that increasing ocean temperatures (caused by AGW) are inimical to healthy reefs (or short term heating events superimposed on such a temperature increase). But the reefs of the last interglacial show this is untrue. These grew at times of higher sea level (+5m) thus less ice and overall higher temperatures,and are significantly more massive than present day reefs that constitute little more than a thin veneer covering the Pleistocene reefs. In other words Pleistocene reefs grew better in even warmer waters than today’s. Are you perhaps implying that present-day reefs are suffering from increased short term temperature spikes? Perhaps they are, but please explain how AGW increases the frequency of such spikes? please explain how AGW increases the frequency of such spikes? I don’t think that AGW necessarily increases the frequency of spikes. AGW increases the baseline temperature, so even if the amplitude and frequency of the variability is unchanged, there is a now a greater chance of crossing a threshold. ATTP. But that’s why looking at the whole length of the GBR is significant. Temperature spikes in the south reach temperatures normal for the northern reef area. So its not the overall rise in temperatures but departures from the norm that are important. Furthermore it is now argued that it is the increased frequency of the spikes that is being emphasised. So I repeat how is AGW responsible for this increased frequency? MiaB. Something is causing reefs stress, resulting in bleaching. Bleaching is caused by multiple different causes, amongst them short term temperature spikes. Overall temperature increases are unlikely causes given 1. the very different normal temperatures that reefs grow worldwide, and 2. experimental evidence that reefs adapt to increased temperatures by exchanging zooxanthellae, which causes temporary bleaching. A slow temperature increase could be adapted to by gradually selecting more suitable zooxanthellae. I am quite taken with the explanation given in Jaime’s blog – an increased frequency of mega Ninos since the 1970s caused by largescale oceanic circulation changes. Last spring (2017), ENSO was not neutral; there was a short sharp positive spike occurring over Apr/May/June. 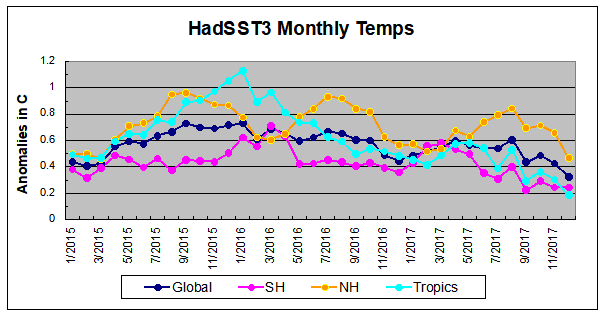 Clearly, warming in the tropics was not quite as done and dusted as some suggest, in the wake of the extremely powerful 2015/16 El Nino. Weak La Nina conditions only made an appearance in Nov 2017. From Feb 2017 to May 2017, the tropical oceans warmed by 0.2C. Only now have they eventually cooled off to 2012 levels. So the argument that the Spring 2017 mass bleaching event is not related to the super El Nino of 2015/16 looks dubious; much the same as the argument that the ‘record hot year’ of 2017 is also not related to the preceding El Nino. The authors find no correlation with the long term warming trend and bleaching events; none whatsoever. As Alan points out above, corals appear to be able to adapt to slowly changing ocean temperatures. What the authors argue is that the return period between powerful El Nino events appears to be diminishing rapidly since the 1980s and it is this continual spiking of ocean temperatures due to El Ninos which is causing the bleaching. They make the unsubstantiated assertion that there is some connection between ‘warmer’ El Nino events and generally warmer ocean temperatures and imply that the diminishing gap between events is also somehow related to global warming, but there’s no evidence for this. Their own data does not support the argument that the long term warming trend is responsible for the increased likelihood of mass bleaching events. I would like to underline the points made about average temperatures made by Alan and Jaime. If GBR bleaching is caused by rising average temperatures, then the relevant data is that of the local area and NOT the global average rise. As anyone who looks at temperature anomaly maps produced NASA GISS, there are huge variations in the average temperature rise over different areas. I reference two graphs produced by Berkeley Earth for towns along the coast. and Rockhampton – which is level with the most southern parts of the GBR. The cities are 1067km apart by road according to Google Maps, so around 1000km as the crow flies. In Cairns, the current average temperature of 23.6°C has been about the same for over 30 years. From 1920 to 1960 average temperatures were around 23.1°C. But average annual temperatures could fluctuate by more than a degree from one year to the next. 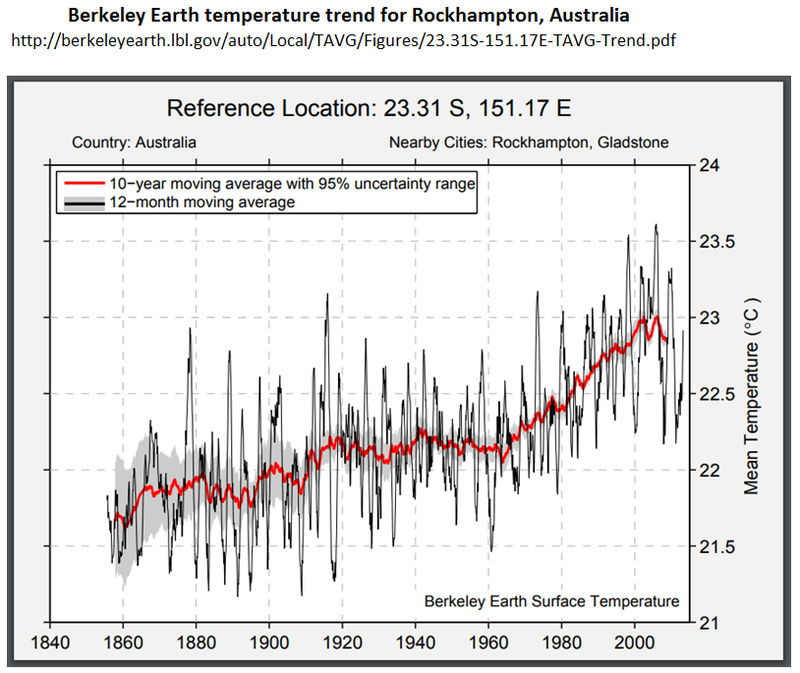 In Rockhampton, there was a steady rise in temperatures for about 40 years until about 2003, of nearly 1°C to about 22.9°C. That is to just below the average temperatures of Cairns from 1920 to 1960. If rising average temperatures are the cause of bleaching, then recent bleaching will be at the Southern end of the reef, and mostly over a decade ago. But the southern end of the reef is still not as warm on average than the northern part in the middle of the last century. In both temperature records I notice a jump in 1980, which was also recorded in Europe. There is very roughly a rise of over 1°C between the 1970s and 2000. But also 1940 was very cold, whereas it is a peak year in the global temperature anomalies. However, with respect to the Great Barrier Reef, neither Cairns (no warming for over 30 years) or Rockhampton (no warming in a decade) have recent warming that can explain recent GBR warming. Yet both have different trends, There is appears to be no temperature data to support the hypothesis that rising average temperatures caused the recent bleaching of corals. Looking at the list, many of the temperature data sets are of short duration, have poor quality data (e.g. Burdekin Shire Council 4875), or have breaks in the data (e.g. Ayr, Burdekin Shire Council 4876). Another issue with respect to the Great Barrier Reef is that many are inland, so might not give relevant readings. However, there are a couple of stations that can be picked out with long records and near the coast. 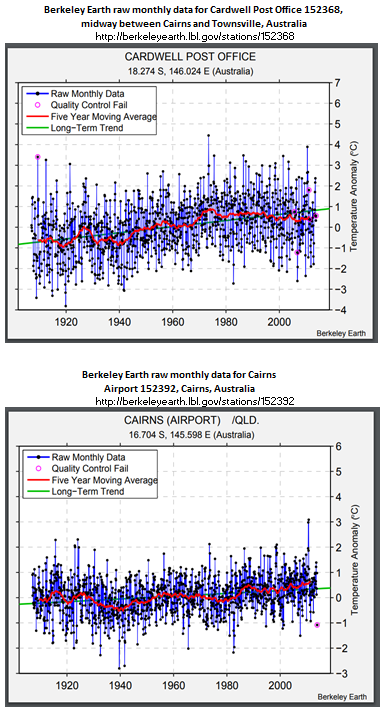 Cairns Airport 152392 (with data since 1908, twenty years before planes first flew from the site) has cooling in the 1930s and warming from 1940 to the late 1950s. The opposite of the global averages. There are no station bias adjustments until 1950, showing that this is typical of the regional expectation. This seems to indicate that not only are average temperatures not a cause of GBR bleaching, but that calculated global average temperature trends are not replicated on the North East Australian coast. I didn’t state this. Temperature appears to be (and is believed to be by all active reef experts afaik) the dominant reason for mass bleaching. The mass mortality events in 2016-2017 matched with elevated ocean temps, per the papers and information provided in my prior reply. I also provided a link to a paper describing equatorial decline of reef corals during the last Pleistocene interglacial, “surprisingly strong given that only small temperature changes have been reported in the LIG tropics”. I encourage you to re-read my replies above. No. Ocean temperatures as a whole have risen, making sustained high temperature episodes more common and causing more frequent mass bleaching events and mortality over time, as the paper cited above discusses. The kinds of hot conditions that led to mass bleaching and mortality are much, much more likely due to ocean warming according to modeling (e.g. 175x more likely per this application of climate models https://theconversation.com/great-barrier-reef-bleaching-would-be-almost-impossible-without-climate-change-58408 ). Please reference citations offered if you want to encourage discussion, thanks Alan. and here is the NOAA ENSO blog entry for May 2017, noting “Ocean temperatures in the [standard representative] Niño3.4 region have been in neutral territory for a few months now”. Seems an attempt to hide from the obvious. The preceding conditions weren’t El Nino but La Nina. Global surface temp through the 2017 bleaching is similar to the pre-El Nino levels. Yes, the new normal is now more comparable to what was ‘extreme El Nino’ levels in 1998 – that’s the point the reef scientists are making. The new normal is warmer because the oceans have accumulated heat consistently for 20 years, to global depth of 2000m. I see Paul’s comments about regional correlation. Interesting enough; I’m having trouble with AAAS account so will need to solve that to read that part of the paper. The more regional you get the more weather, current etc. variability you get, sounds like that is a big deal. You still have overall trend of warming and therefore overall trend of increasing likelihood of temperature surges capable of inducing severe bleaching events. As observed. Well, this isn’t accurate, the core finding is stated in the abstract: “We analyzed bleaching records at 100 globally distributed reef locations from 1980 to 2016. The median return time between pairs of severe bleaching events has diminished steadily since 1980 and is now only 6 years.” That, of course, correlates with warming and matches what modeling says should happen, per above. Yes this is the core question – can coral adapt fast enough to the pace of warming – you and Alan are just begging it. At this point there is a large volume of research and findings that says they aren’t. In particular what we are observing in the real world – escalating rounds of bleaching mortality and sharp downward trend in cover. And of course calling the current rate of ocean warming ‘slow’ in evolutionary/geologic terms contradicts available observations and proxy reconstructions on that point. No, this is not what the authors state. This seems to be more along the lines of your alternate hypotheses actually – that the speed of severe El Nino events is speeding up, and that El Nino (not tides but associated pace of change in SST?) is the cause. This speed-up is happening for some unstated/unknown reason, and just happens to mimic the mass bleaching results that the mainstream view around thermal tolerance and warming trends predicted. Nothing wrong with alternate hypotheses, but I think you underestimate how much research contradicts your idea already. Anyway, certainly when proposing a hypothesis you assume burden of proof for providing supporting evidence. Thanks for the response, I’ll look at the regional thing. I see manicbeancounter doing some eyeballing of individual station data. If you want to dispute the Hughes type papers, you should get into the calculations of sustained heating “degree heating weeks” they actually make. Extremely long-winded comment which doesn’t manage to effectively argue against a single point I made. Ah. 🙂 Well, I suppose that is a reasonable exit under the circumstances. To recap: You are incorrect about the 2017 die-off being during El Nino, but it’s not clear what you’re trying to argue in denying it anyway. You’re incorrect about what the paper says/doesn’t say. Your citing of the ISCCP and tidal theories is wildly amiss, to be polite. Your article and comments appear to boil down to repeatedly asserting a view that is different than that offered by reef scientists, biologists, and observations. You seem to maybe have some speculative alternative hypotheses about why global warming might not be contributing to more frequent and severe mass bleaching, but have not so far successfully articulated these or offered supporting evidence. Leaving it there seems reasonable, cheers. Geoff. Interesting paper on interglacial coral diversity geographic patterns, however, rather predictable (and probably wrong) conclusions. Paper suggests that a lower diversity of corals in equatorial locations is the result of hotter seawater conditions. Several things wrong with that 1. Coral diversity does not equate to coral reef abundance or mass. The Pleistocene reefs I know best (Florida and the Maldives) have low species diversities but are significantly more massive than their Recent equivalents, 2) although the pattern of Recent coral diversity has a significant latitudinal component, this is not the only one. Maximum diversity occurs in the Philippines and Indonesia and declines in all directions from this area. Atlantic coral diversity is noticeably lower than that of the Pacific. Furthermore I note that this is a paper study, the authors rely upon other people’s determinations and observations. There is no separation of reef types and shelf edge* reefs have much less diverse faunas than backreef or deeper reefs. To determine coral diversity gradients one would have to compare like with like. If the more equatorial locations were barrier reef edges and were being compared with tropical back reefs, well…..
*Unlike Recent Atlantic reefs, Pacific reefs lack Acropora palmata, whose massive branches are able to withstand the full force of ocean waves. Pacific reefs lack corals along their edges and these locations are marked by (red coralline) algal ridges. Clearly comparison of like with like (seaward edges) would who greater diversity in the Atlantic than the Pacific. Acropora palmata is a Recent species that had not evolved in the last Interglacial. One last point Geoff. I did not state that the 2017 bleaching event occurred during El Nino conditions, I pointed out that it did not occur during ENSO neutral conditions. ONI is but one popularly used measure of the tropical Pacific ocean. ONI indicated neutral conditions at the time. The multi-variate ENSO index (MEI) is another, more comprehensive measure. MEI in Spring 2017 indicated a brief return to El Nino type conditions and global tropical ocean temperatures did indeed begin to warm before falling back. ONI is the SST-based index, when talking about sea surface temp. MEI brings in air temp, pressure, cloudiness – I saw the blip, but it happens after the 2017 bleaching, Feb-Mar is very neutrally scored there as well (-.08). But again, not clear what alternate physical hypothesis you are trying to advance to explain the pattern of escalating bleaching severity. Geoff Price @ 05 Feb 18 at 6:34 am claims the continued bleaching was predicted. These two papers predicted increased bleaching as a result of continued warming. 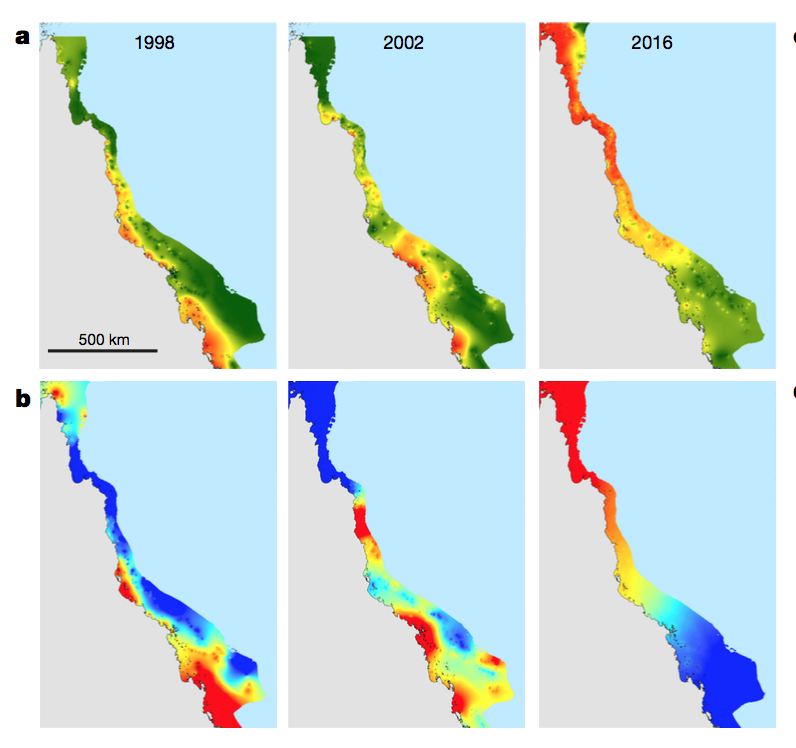 In previous comments, I used coastal temperature data as a proxy for actual Great Barrier Reef data. They showed a lack of warming in recent years. I have found two sites on the GBR that have give a similar picture. Lihou Reef (17.117 S 152.002 E) and Marion Reef (19.090 S 152.386 E). Both for fairly short periods and the quality of the data is poor. (Not surprising considering the locations) But neither show any warming trend since the 1980’s. There is a third set of data on the GBR, where the quality is even worse than the other two. Creal Reef (152343, 20.532 S, 150.380 E) also shows no warming trend since the mid-1990s. The hypothesis was that bleaching events would continue to increase with warming oceans. In the case of the GBR, the data shows that for at 20 years or more the ocean does not seem to have been warming. The continued bleaching shows that any previous correlation of bleaching with rising temperatures appears to have been by chance. It does not matter how many domain experts claim that there is a link, nor how many peer-reviewed papers and Conversation articles are written offering excuses. If the data disagrees with the hypothesis, then the hypothesis is wrong. Proper scientists will learn from the failure, and look to modifying their existing hypotheses, or look to alternative hypotheses. In so doing the very failure of clearly stated and bold hypotheses lead to increased collective understanding. But Climateers gaze inward to their models, adjust the data to the hypotheses, waffle on about their expertise and build a consensus fortress to shut out objections. It’s not clear whether you are disputing the role of heat in bleaching, or just whether rising global ocean heat is having any impact (critics seem to hop around hoping for footing.) The evidence shows that coral live pretty close to their upper tolerance for thermal stress, and so are pretty sensitive to warming on the ~1°C scale of post-industrial warming to date. It is pretty difficult to imagine how it could not have an impact, but feel free to speculate. This sort of spot checking is not likely to be too illuminating. The hypothesis is not that local/regional warming trends will mirror global warming trends and drive bleaching. Exactly where do I make that claim? Regional trends are different. I believe that any relevant effects of the global rise in average temperatures will come through the impact on local temperatures. Though there is plentiful evidence that GISSTEMP has an increasing warming bias, even they agree that the GBR area in 2013 had no significant warming compared to 1951-1980 baseline, whereas the global rise was 0.63°C. To get back to the Eric Holthaus article that is the subject of Jaime’s post. From the abstract. As global warming has progressed, tropical sea surface temperatures are warmer now during current La Niña conditions than they were during El Niño events three decades ago. Not in the Great Barrier Reef they ain’t. Being the biggest reef in the world that is a significant contradiction of the claim in the article. Yet bleaching events are still meant to be occurring the GBR like in other reefs. Now Geoff, if you point to articles that say something different, fair enough. Just shows that there is no consensus on the causes of climate bleaching. 1) Explain, in the context of Jaime’s post, why lack of warming in the GBR is “not likely to be too illuminating“. In the meantime, I have “liked” your comment 22115 as a good example of climate trolling. There is a lot that others can learn from it. Your station charts don’t obviously look flat. Your GISS chart indicates 0.2°C – 0.5°C. Here is sea surface temp anomaly for March in the Great Barrier Reef according to the Australian BOM, looks like this is ERSSTv5 from 9 grid points around the reef. Looks closer to 0.5°C in trend with a hell of a spike with mass bleaching. The relationship between global trend and local DHW risk is a statistical question, I gave some examples above of analysis looking at that which you aren’t looking at. What evidence would that be (just curious). There are multiple documented causes of bleaching but thermal stress is the well-documented cause of mass mortality events like 2016-17 in the GBR; no reason you can’t dispute that but neither of you have offered any evidence. The Hughes graphic showing SST/DHW lining up with bleaching severity is pretty self-explanatory. 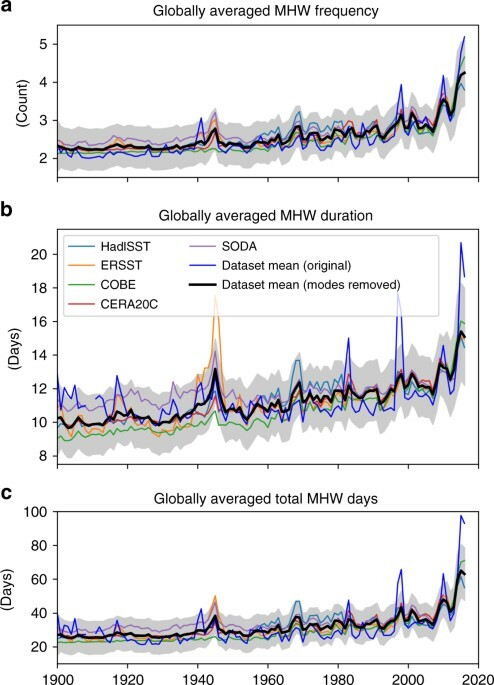 (If actually interested, an example of a paper that gets into general DHW metric predictive performance against SST and bleaching data across hundreds of global events is Donner 2011 “An evaluation of the effect of recent temperature variability on the prediction of coral bleaching events”). just one possible interpretation of what you were trying to argue, since you didn’t make it clear. That temperature anomaly chart is what in the oil business used to be called a geophantasmogram – utterly unbelievable. It purports to show the March temperature anomaly since 1900 for the Great Barrier Reef (all of it : over 2300km, and with a north-south temperature range of more than 6 degrees C). Strange that Manic struggled to find a handful of temperature sites, yet that organisation the Australian BOM, well known for its integrity (“not fit for purpose”) could, by some slight of hand, produce this masterpiece. Perhaps when some real scientists start studying the reef, who aren’t obsessed with ‘proving’ the case that man-made global warming is responsible for mass bleaching, they will identify the many different stress factors which may have been made more frequent by altered weather patterns, particularly since the beginning of the 21st century, particularly relating to extreme El Nino events and the incidences of flooding and drought during the Australian Monsoon and its profound effects upon water chemistry. It’s quite frankly moronic, this insistence that global warming has increased the threshold for thermal tolerance and now reefs are going to start dying everywhere from heat stress only, regardless of changing weather patterns, regardless of poorly quantified regional variations in SST, regardless of water chemistry, tides, solar irradiation variances etc. It’s politically motivated Mickey Mouse science and the proof, if you needed it, is the abhorrent treatment of Peter Ridd. Kevin, thanks for this Feynmanic remark! Thanks, I appreciate it when individuals make it clear that they are leaning ultimately on fraud/conspiracy arguments, as it clarifies that empirical discussion is a distraction from the main concern. I acknowledge the possibility of such fraud but in a Feynmanian sort of way prefer to see evidence for such theories. Probably not a lot needs to be said about this. Per above, the latest round of mass mortality, which dwarfed the bleaching during the extreme El Nino event of 1998, happened under ENSO Neutral conditions. Your hypothesis is thus contradicted by evidence and must be revised – Paul has helpfully shared a Feynman clip that is relevant. The role of water chemistry in reef behavior has been extensively studied, perhaps more actively than the role of thermal stress; presumably you are just unfamiliar. And specifically in this context, an example from the Hughes paper “Once we account for the amount of heat stress experienced on each reef, adding chlorophyll a, a proxy for water quality, to our statistical model yielded no support for the hypothesis that good water quality confers resistance to bleaching.” Feel free to dig into the relevant lit more, but in the meantime Paul’s Feynman clip is again useful. This is in the category of misunderstanding the science you are purporting to contradict – there is no such insistence. Bleaching is happening because the threshold for thermal tolerance, if it is moving appreciably, is not moving fast enough to stay ahead of the pace of ocean warming. This is not a “proof”, but something more akin to an appeal to minority authority fallacy. Overall you appear to be dispensing with even a facade of evidence-based argument here. He didn’t. You clipped his main point. Geoff. 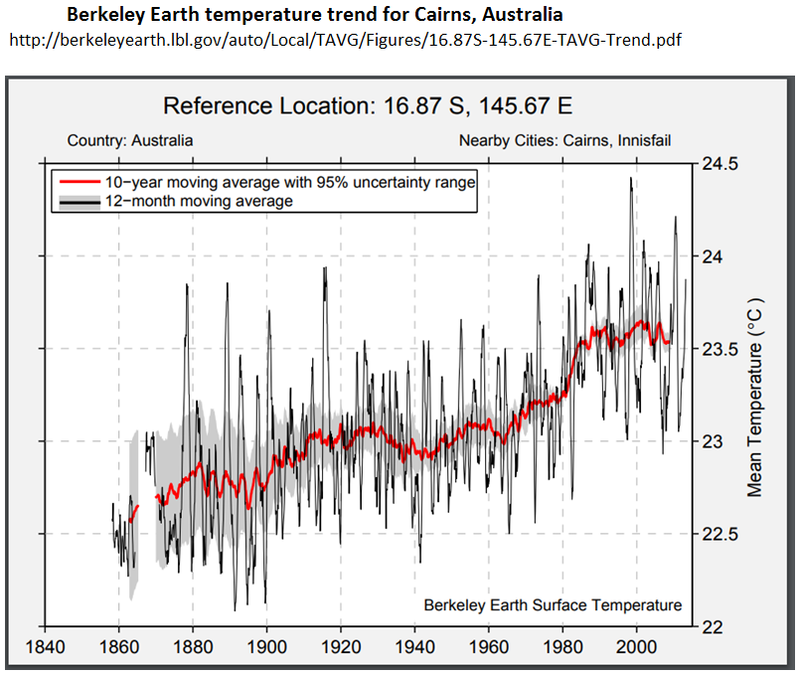 I certainly do not disbelieve indications of temperature increases, but I get very suspicious when I read that organisations like the Australian BOM ceaselessly manipulate and modify what historical temperature series that they have. I also find it laughable that those organizations produce such obvious fakes as that diagram you tried to foist onto us. That some get suckered by them (and try to use them as evidence) is really, really funny! Meanwhile, the promised effects on our doorstep — extreme weather, failed agriculture, disease, social breakdown and economic chaos — all seem so far to have failed to materialise. That’s as tangible an observation as any environmental metric. The problem for environmentalists is that life has been getting better — longer, healthier, wealthier — for the majority of the world’s population. The most progress ever seen in its history, in fact, in the last two decades. Yet precisely the opposite was predicted. Again. And again. GMP also wanted to say, ” I appreciate it when individuals make it clear that they are leaning ultimately on fraud/conspiracy arguments”. In fact Alan’s comment was about competence, not conspiracy. Environmentalists and their pet scientists do have questions to answer about their measurements and prognostications. We have more than half a century of data that needs explaining. Which is odd, because they said nobody would be around to explain it by now. What did you see Alan’s main point to be? It was a short comment. That data back near 1900 is less reliable? That’s not particularly relevant here, and a wide range of observations corroborates 20th century global warming itself. That calculating an average for a larger area is meaningless? It’s not, and in fact reduces risk of individual station bias or siting issues… my reply regarding corroborating data talked to this as well. Well done, GMP, you have correctly identified what I believed to be the main point Alan made. It’s almost as if you already knew! Well, that rather depends on how you move from the data you have to the final figure doesn’t it. One thing that may be causing various governmental meteorological offices (the UK MO does it routinely, too, and makes a fool of itself to anyone with A-Level stats) to play somewhat fast-and-loose with data may be the pressure on them to supply the ‘evidence’ to political arguments, on demand. You may want to say that this, too, leans to the ‘fraud/conspiracy’ tendency. But it’s in fact an observation that the production of knowledge is a social (in the sense of, it requires social organisation, not in the sense of it being leisure) activity, the agenda of which is driven by political priorities. It could only be excluded in the event that science had found a way to eliminate such influences… In which case it probably either wouldn’t be funded, or wouldn’t be necessary. Ha, ha, ha. please stop. When presented with evidence that trumps the argument, it is worth actually trying to understand how well that evidence supports the argument. The first thing that struck me is why use March data alone? What about the other 11 months data? Click on the link and you find that there is another problem. The data goes to 2017. The latest annual data gives a slightly different picture. I have set the moving average to 10 years to make it compatible with the Berkeley Earth dataset. The recent El Nino’s of 1998, 2010 and 2016-17 can be clearly seen. But that is not the most interesting part. Look at the 10-year moving average. The most significant warming is from 1950 to 1980. The rate of warming then slows down dramatically, only picking up after the 1998 El Nino. Yet the global average data sets like HADCRUT 4 show little or no warming until the mid-1970s when the rate increased, then slowing dramatically. I find that an anomaly worth investigating rather than trying to brush away. Especially as the coastal towns by the GBR show different trends. Now, if you accept the Australian Bureau of Meteorology’s data as being a true and fair view (I don’t) there are two interesting points of note. 1. Where is the CO2 impact on warming in the GBR? 2. If crossing a warming threshold is the cause of reef bleaching, why was bleaching evident in the 1960s? Maybe it did not exist, or maybe there were no concerned scientists taking the onerous task of scuba diving in for months on end observing the bleaching? Geoff, what don’t you understand about these graphs? They show the total amount of warming since 1871 according to HadSST, plotted against the number of severe bleaching events at each location. There is no significant positive correlation, indeed in the Western Atlantic and Australasia, it actually appears that the number of severe bleaching events declines slightly with increasing sea temperatures. Hence the authors are forced to conclude that it is the increasing frequency and severity of brief periods of extreme heat which are responsible for mass bleaching, not the long term global warming trend. If the threshold for tolerance to long term sea surface warming was not moving fast enough to keep up with the general warming trend, then there would necessarily be a strong positive correlation between the amount of warming and the number of severe bleaching events. There isn’t. Hypothesis disproved. Feel free, of course… not really an “anomaly” as regional patterns are not expected to exactly match global, but knock yourself out. Getting far afield from the subject though. Re-litigating generic objections to global greenhouse ocean warming attribution is probably not too productive here. I’d summarize (to great objections here, naturally) by saying the reason the bulk of the scientific world accepts this is that it is the only observed/known/real physical influence on the planet’s energy budget consistent with observations, including measured ocean warming to depth, and is in fact what is expected to be happening in applying 20th century physics of radiative transfer theory, thermodynamics and so on. Some isolated smaller-scale bleaching was observed in the 1960s, yes. A main distinction is around scale/severity of bleaching and mortality now being seen – generally there is no evidence of *that* in the earlier 20th century. Mass death leaves evidence (dead coral fragments). 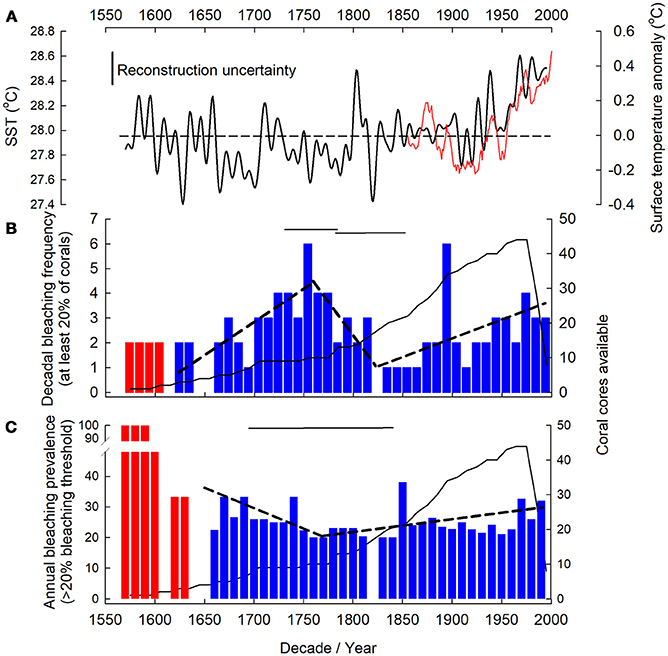 I’m aware of at least one earlier extended coral collapse event in GBR area, apparently related to human impact between 1920 and 1955, but importantly no sign of major mass die-offs on this scale in the longer term record – callout is “remarkable long-term stability in coral community structure over centennial scales”. There has been some signs of possible larger temperature-related bleaching events detected in more distant geologic past, I believe. Manic. Until recently I believe bleaching on the GBR was highly localized with adjacent reefs sometimes displaying very different degrees of susceptibility. 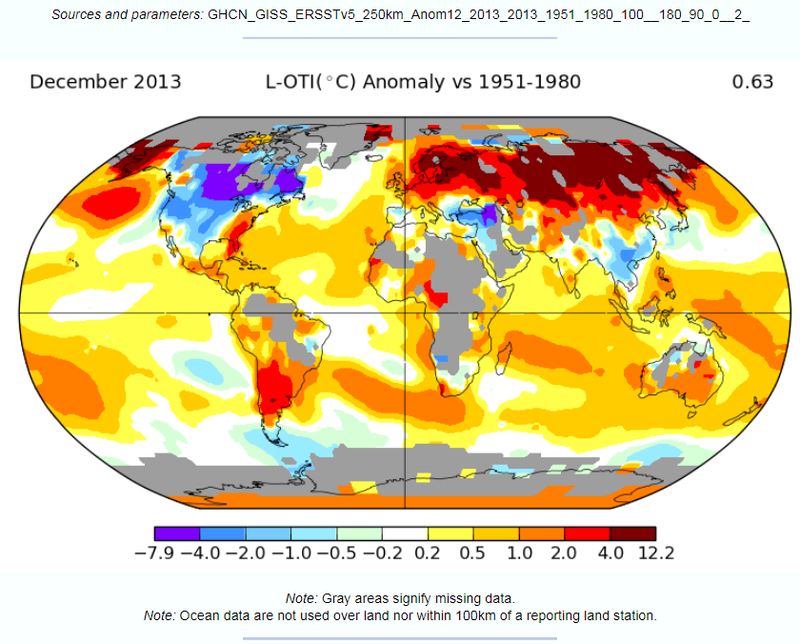 Even the maps shown by geoffmprice show the patchy distribution of bleaching matching a map of temperature anomalies. Consequently when presented with a graph of a temperature anomaly for the whole of the 2300km long GBR extending back to 1900 I 1) failed to see its relevance and 2) simply disbelieved data extended that far back. I also knew that parts of the reef has been severely affected by nitrogenous waste from farming runoffs. A colleague of mine worked on the Burdekin River system. Experimental work suggested that reefs are more susceptible to bleaching by short term temperature rises if previously stressed by this river’s runoff. Bleaching is much more complex than just reaction to temperature anomalies, regardless of what GmP writes. It is worth trying to understand the dramatic difference in trends. One front is that the Australian BOM has strong biases. There is plenty of evidence for this Joanne Nova’s latest post is on the failure to adjust for clear measurement biases at the Sydney Observatory. Jennifer Marohasy has been looking at homogenization issues for at least six years now. However, my belief is that the process of compiling the global average temperature anomalies – from looking at the land temperature sets in the first half of 2015 – is fundamentally flawed. It arises from not questioning assumptions, and not checking the results of data adjustments. 1. Temperature land data is from temperature data sets that are unevenly dispersed. 2. The data is often of poor quality and suffers from measurement biases. 3. To calculate an average for a given area, each surface temperature station needs to reflect the trends of the surrounding area. 4. There is a crucial assumption to enable this to happen. As Venema et al 2012 states. The most commonly used method to detect and remove the effects of artificial changes is the relative homogenization approach, which assumes that nearby stations are exposed to almost the same climate signal and that thus the differences between nearby stations can be utilized to detect inhomogeneities (Conrad and Pollak, 1950). 5. In many areas, even temperature stations quite close together, show different climate signals. Variation in trends to increase with time and distance. 6. (Not confirmed) Homogenisation through pair-wise comparisons starts with the most recent data. As data becomes more distant from the present, trends are reduced. 7. Before 1945, the number of temperature stations drops off, so real trends are homogenized out. 8. Data is homogenized a number of times, so all that you have no objective basis when checking the data of knowing what homogenization results are anomalous or not. there is a problem, highlighted by one blogger in describing the homogenization process. What one has to do is look at the data for each site and see if there’s anything that doesn’t look right. We don’t expect the typical/average temperature at a given location at a given time of day to suddenly change. If there is a failure to question assumptions and strong beliefs about how the data ought to look, then under continuous processing the data will get ever closer to beliefs. 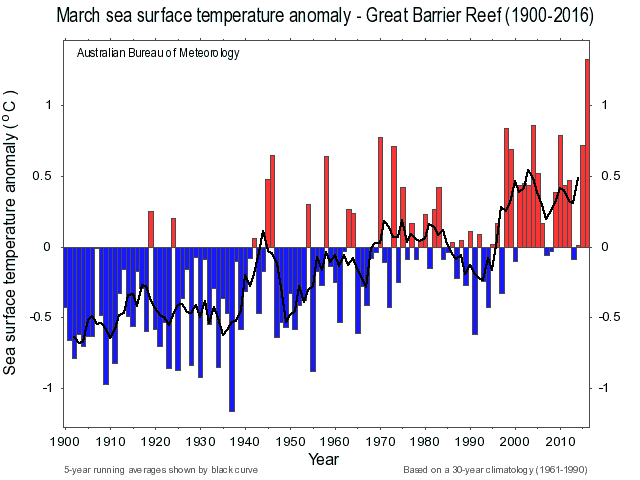 If I am correct, then the anomalous sea surface temperature trends in the Great Barrier Reef are explained by a combination of (a) fewer observations after 1970 and (b) a divergence in trends after 1970 within the area and in adjacent areas. It seems intuitively reasonable that short-term shifts in temperature should have a bigger influence on bleaching than the long-term trends. There is an article at the Conversation in April 2016 that GmP refers to, that shows the daily see anomalies for March 2016. This was a peak El Nino month. The scientists make no mention of this, so the reader gets the misleading impression that this was all due to human-caused climate change. Geoff. It seems ever more evident that your learning comes from books. Massive mortality in reefs is not defined by broken fragments. Most barrier and fringing reefs are associated with ramparts or backreef flats composed of coral rubble. Reefs have evolved specifically to withstand major storms (some corals are even distributed by their fragments being formed and moved to new locations). To recognize mortality associated with bleaching you need to demonstrate that the reef corals were replaced by algae or sea grasses. The only way this can be established is by finding concentrations of the remains of skeletons of organisms that encrusted the plants. This takes a deliberate search which is rarely done. The frequency of past bleaching has not been properly researched. If reefs are super sensitive to higher temperatures, then how could Reefs have survived during the Holocene optimum? Well done for spotting the Feynmanic remark!. It is worth watching the entire 10 minute video for other illuminating quotes. In the same lecture, at around 5.10 here Feynman said something that is maybe more relevant to the whole climate debate. You are probably familiar with that in other fields. For example “A hates his mother”. The reason is, of course that she did not caress him or love him enough when he was a child. Actually, if you investigate you find out that, as a matter of fact, she did love him very much and everything was all right. Well then it was because she was over-indulgent. So by having a vague theory it is possible to get either result. In terms of coral bleaching, you can say it is due to climate change. It could be then due to global warming, or due to increased variability consequential upon it. With a rich source of waffly peer-reviewed papers and biased statistics, no amount of real evidence on natural variability, or understanding the observational biases (how many climate researchers were scuba diving the GBR prior to 1950 monitoring the reefs?) will sway them. After the first minute, Feynman went on to say about taking “guesses”. As an illustration, he recounted a conversation about flying saucers with a “Layman”. F : I don’t think there are flying saucers. L: Is it impossible that are not any flying saucers? Can you prove there are no flying saucers? F: No I can’t prove it’s impossible – it’s just very unlikely. L: You are very unscientific. If you can’t prove it’s impossible, then how can you say it is unlikely? It is only scientific to say what is more likely and less likely, and not to be able to prove to all the time what is possible and impossible. F: I mean from my knowledge of the world that I see around me, I think that it is much more likely that the reports of flying saucers are the results of the known irrational characteristics of terrestrial intelligence than the unknown rational efforts of extra-terrestrial intelligence. The same could be said for belief in the CAGW hypothesis. I previously noted Fig. S4 was interesting. I appreciate Paul flagging it. *Again*, the authors plainly do not conclude this; the paper makes no claims about increasing frequency and severity of brief periods of extreme heat (no support for this in any case in temperature data or ENSO indices). It states that individual bleaching events are caused by short-lived episodes of extreme heat “superimposed on much smaller long-term warming trends”, but that the inevitable rise of the latter over time is now resulting in the fact that “the average interval between bleaching events is now less than half what it was before” and “the median return time between pairs of severe bleaching events has diminished steadily since 1980 and is now only 6 years”. Also “As global warming has progressed, tropical sea surface temperatures are warmer now during current La Niña conditions than they were during El Niño events three decades ago” and that “coral bleaching is occurring more frequently in all El Niño–Southern Oscillation phases” (58% during four strong El Ninos, the remainder in other ENSO phases but mostly in summer). So 2A and 2D seem the main figures for those comments. More severe bleaching in recent years (globally) and shorter intervals between. Yes, figure S4 is minimally quite counter-intuitive paired with this. It looks at frequency of events only, i.e. ignores severity, and looks all the way back to 1880 (meaning base temps not necessarily so close to thermal thresholds over much of this time). Short-term temp events (driven by currents and wind, ENSO or weather events) can easily swing water temperature by increments of full degrees C, much larger than the very incremental increases in base temp from global warming in any given slice of time. And that is what you see dominating in this chart, the stochastic nature of such events appearing to overpower any other signal. I think there are a few ways to try to cut such data that might be more interesting. Of course the differences in severity are pretty relevant. Mass mortality of say a full ~quarter of the 133K sq. mile GBR in a single season appears completely unprecedented. For this to happen in ENSO Neutral and be an order of magnitude more mortality than the extreme El Nino event in 1998 is more central to the concerns about impact. Yes, the specific hypothesis of whether “the number of bleaching events that have occurred so far at each location is positively related to the level of postindustrial warming of sea surface temperatures that has been experienced there”. As stated by the authors; you are just repeating them (accurately, here). I hear that you would like to expand this to a disproof of the role of warming in bleaching completely, but this contradicts lots of other evidence and I’d categorize in the (overfull) “dropped a leaf in the wind and disproved gravity” fallacy bucket. My reply on homogenization stuff didn’t make it through, apparently. Let me know if/when you get to the bottom of why scientists globally seem so intent to falsify the data record in order to show less global warming over the 20th century than the raw data shows. On individual events of course, on the pattern of rising mass mortality over time no. Not really what I said, and I was just summarizing a paper in passing. If you have more specific/useful criticisms of published papers looking at paleoclimate evidence of reef events feel free to share. * the question with respect to CO2 pollution impact is not necessarily species survival; ecological and economic impact of reef loss scales with cover, not species extinction. The trend is already sharply down on actually observed coral cover. Dead coral don’t weep for no one. Much of what you say is confirmed in Climate Change: The Facts 2017 Chapter 1 “The Extraordinary Resilience of Great Barrier Reef Corals, and Problems with Policy Science” by Peter Ridd. the Great Barrier Reef since the 1940s. checked, that conclude the imminent demise of the Great Barrier Reef. of claims that the Great Barrier Reef is in peril. Geoff. Bleached coral does not unnecessarily mean dead coral. Only if the coral cannot recruit a new suite of zooxanthellae within 3-4 days will death occur. You write about the corals adapting, but it is a question of zooxanthellae recruitment. If they are available the corals will survive. Clearly you are floundering to explain reef survival during the Holocene optimum. Never heard of poetic license? Geoff, you obviously haven’t read the paper that well. If you look at the graphs, the vertical axes are clearly marked “severe bleaching events”. Also, it doesn’t go all the way back to 1880. The HadSST data they used to calculate total warming goes back to 1872 but the number of bleaching events is drawn from a database which encompasses the period 1980-2016 only, as data before then is sparse. However hard you try to wriggle out of it, however many contradictory quotes you use from the main text of the paper to try and justify your assumption that global warming is responsible for mass bleaching, the fact remains the same – there is no correlation between the long term warming trend and the number of bleaching events (total and severe) at the four locations. If statistical analyses are to be relied upon, climate change appears to play no role in coral bleaching; weather however, does appear to significantly affect the risk of bleaching events. Indeed. Commonly differentiated by using terms like “bleaching” and “mortality” respectively. Earlier mass bleaching episodes did not result in the widespread mortality observed in more recent events. I didn’t mean filtering events by severity, I meant that the exercise appears to be about event frequency vs. severity, e.g. a bleaching event with no significant mortality in say 1994 is presumably counted the same as the 2016 event killing off a quarter of the GBR. But yes, fair correction that it is already filtered by >30% site bleaching. Hmm, it appears otherwise but I agree not crystal; the label on the figure and in the text says “since the pre-industrial period” (see your chart graphic above), and the section about it in the supplement says “To examine the relationship between the amount of global warming and the number of bleaching events per location, we also extracted monthly sea surface temperatures from the HadISST data set, for 1871-2016 (25), for a 1-degree latitude by longitude box centered on each of the 100 reef locations” – and I don’t see how you would need HadISST since 1871 if you weren’t using it. Clearly the older data on bleaching is less reliable. I agree it would be nice to ask further questions about that particular exercise; I tried to contact one of the authors but got no response. Yes, I’m aware this has been your consistent thesis independent of the arguments you landed on trying to justify it. The problem is that it contradicts physical logic (how physically could ocean warming on this scale not affect coral bleaching from ocean temp?) and the findings of the paper you are citing. The core result is “the number of years between recurrent severe bleaching events has diminished fivefold in the past four decades”, which plainly correlates with global warming. Physical causation is both directly expected and observed, and backed up by modeled expectations of results from ocean warming, per the various points you still haven’t made an effort to address (or, to appearances, engage with). I think we’re agreed at the high level: your citing of figure S4 and manic’s appeal to Ridd’s authority, in my view, are both much better (and I think, sufficient for purpose) contrarian talking-point-level responses than the earlier trial balloons you floated (caused by low tides, “caused by El Nino”, caused by decrease in cloudiness, etc.) If this exchange helped hone that talking point level response, great. I’m personally curious about the separate exercise of understanding the details, reality and evidence regarding coral bleaching. Cheers. During one of my recent climate change presentations a member of the audience broke into the middle with an obvious challenge about the Great Barrier Reef dying because of ocean acidification. Rather than go off track I expressed my doubts saying that’s not what I recalled and tabled it until the end. I had some understanding about the GBR, but had to do more research. The claim is wrong on two points. Above a pH of 7.0 a solution is alkaline and becomes more or less alkaline. Below a pH of 7.0 a solution is acidic and becomes more or less acidic. The ocean’s pH is about 8.0. That’s alkaline. Variations are more or less alkaline, not more or less acidic. The obvious reason for incorrectly using the term “ocean acidification” is a propaganda gambit to scare the gullible and uninformed who associate acid with bad, like alien blood and spit. Highly alkaline compounds such as caustic soda can be just as dangerous as acidic compounds, e.g. concentrated bleach, sodium hypochlorite, pH 9 to 13. On the other hand: rain has a pH of 4.5, lemon juice has a pH of 2.0, tomatoes a pH of 4.5, and vinegar a pH of 2.2. If they get on your hands the flesh doesn’t melt and they don’t burn a hole in the kitchen counter. Improperly using the term “acidification” to scare the public over bogus CAGW is a disgrace to science. Spit out the Kool-Aid and grow a backbone. Bleaching is not dying. There have been numerous bleaching incidents in the past. Bleaching is caused by, among other causes, warm water temperatures especially those caused by El Ninos and NOT pH. The GBR has always mostly recovered. Long term damage or death has been relatively minor. The polyps and other life that inhabit the coral structure die when the water gets too hot or too cold or too fresh and when the conditions revert they recolonize. That’s the way it has been going for millions of years. Also during the post presentation the same person stated another BS MSM sound bite and another member of the audience pronounced it BS whereupon they got their undies in a knot and stomped out of the room like a six year old possibly to go whine at their mommy. If you thin skinned uppity millennial snow flakes don’t want your BS challenged quit believing the MSM and green web site sound bites & do your own homework and thinking!!! Yes, saving the world makes one all warm and fuzzy. Too bad it’s not real. Per GBRMPA over 75% of the GBR is just fine. 22% is badly damaged, 85% of that is in the northern sector and El Nino was at fault. (1) is a common throwaway tactic to try to imply that science on the issue is flawed because of some wording or naming question (i.e. without actually showing that any actual science is flawed). By your argument, the term “acidosis of the blood” (meaning pH < 7.35) similarly proves that medical science is a hoax. (2) You should read the comment thread. Bleaching is not dying, but dying, it turns out, is dying. GBR cover trend is down, about 50% of previous GBR cover lost already according to De’ath 2012, and that was before the 2016-17 mass die-off. There will be regrowth between mass mortality events, but with ocean heat rising there’s no reasonable expectation that the multi-decade cover decline trend will reverse. Doing your own homework is always solid advice for people willing to take the time to test their opinions against evidence. Peter Ridd and James Cook University appear to have a difference of opinion about this. And the University is swinging the anti-science retaliation censorship hammer. As I said above, I agree appeal to Ridd’s authority is probably the best contrarian play here, filling a Crockford type role. Core of his argument seems to be a variant of the common “coral have been around awhile, just like the dodos, so they’ll be fine.” So yeah it’s appeal to authority fallacy (to an outlier expert, i.e. clearly fallacy form) and also the expert’s point of view appears mostly fallacy-based, so not objectively strong but in the absence of an evidence-based case you work with what you have. Also see the discussion around table S4 above – Jaime’s original post at top is pretty hopeless, but Paul helped pick out something better from the paper to handwave about. Pair this with the Galileo gambit on Ridd and I think you’ve got a serviceable smoke play at the moment, for internet-level conversations. Not going to keep the reefs from baking off further obviously but shrug on that (sniff, sniff, *reaches for Kleenex*). Geoff is a prisoner inside his own ‘global warming causes global coral bleaching’ meme and he can’t seem to break out of it, so everyone who points out the inconsistencies of this view is hopelessly wrong and all evidence to the contrary is just ‘hand-waving’. The relatively slow, incremental rise in ocean surface temperatures since the cool period of the 1960s-70s, simply must be responsible for global coral bleaching events, even though these events are highly correlated with El Ninos in 1982/83, 1998, 2010 and 2014/16, even though El Nino events have been shown to occur far more frequently during positive PDO phases (as we have seen since 1976). Severe bleaching along the GBR in 2017 is damning evidence that ‘global’ coral bleaching is unrelated to El Ninos and due only to global warming because 2017 was an ENSO neutral year. Despite the fact that global bleaching events are triggered by sudden extreme rises in water temperature due to El Nino and despite the fact that hot, sunny, calm weather combined with very low tides during ElNinos can also contribute to regional mass bleaching events, Geoff states unequivocally, sans evidence, that “global ocean temps are rising faster than coral bleaching thresholds”. Geoff will continue to believe this no matter what and he will always have something more to say which he claims proves his ‘evidence-based’ assertions. “Here, we use linear extensions from 44 overlapping GBR coral cores to extend the observational bleaching record by reconstructing temperature-induced bleaching patterns over 381 years spanning 1620–2001. Porites spp. corals exhibited variable bleaching patterns with bleaching frequency (number of bleaching years per decade) increasing (1620–1753), decreasing (1754–1820), and increasing (1821–2001) again. Bleaching prevalence (the proportion of cores exhibiting bleaching) fell (1670–1774) before increasing by 10% since the late 1790s concurrent with positive temperature anomalies, placing recently observed increases in GBR coral bleaching into a wider context”. Here is the reconstruction (red bars indicate years where less than 2 or 3 cores were available). One can see immediately that the current prevalence and frequency of annual and decadal bleaching >20% is unremarkable when compared to previous years. Bleaching frequency (number of years per decade in which >20% corals were bleached) reached a peak in 1750, higher than 2001. Annual bleaching prevalence (% of corals bleached) was also higher in the late 1600s than in 2001. This rather puts the supposed ‘catastrophic’ modern Great Barrier reef bleaching due to global warming into perspective, does it not. A comment at ATTP links to this Conversation post by Dan Smale, author of a recent study of marine heatwaves. I’ve left a comment at the Con and also one at ATTP which (of course) is in moderation. It’s not a good look for a scientist to be advocating radical policy on GHG emissions reductions to prevent MHWs when their own research demonstrates that at least half (very possibly more) of the MHWs they studied are associated with naturally occurring weather events. I distrust this “ocean heat wave” data simply because data coverage has increased dramatically over the period analyzed. One would naturally find more localized heat waves with better data. But the other thing is just that perhaps we are better able to capture via sattelitte the bleaching events that occur. SST has increased by perhaps 0.7C since the 1880’s. Probably less in the tropics. If corals are that heat sensitive one wonders how they ever survived in the past.